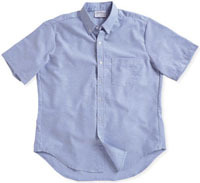 Custom Imprinted Oxford Shirts, Printed, Customized. 4.5 oz. 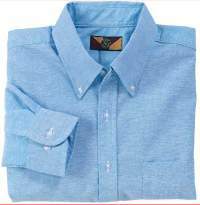 60/40 cotton/polyester oxford cloth with pearl buttons, button down collar, V-top left chest pocket & hemmed sleeves. Prices: Short sleeves Shirts (S-XL) $26.95 for one. 2-12 shirts (S-XL) $25.95 each. 4.5 oz. 60/40 cotton/polyester oxford cloth with pearl buttons, button down collar, V-top left chest pocket & two button adjustable cuffs. Prices: Long sleeves Shirts (S-XL) $29.95 for one. 2-12 shirts (S-XL) $28.95 each. For short and long sleeves shirt sizes XXL, add $4.00 ea. For XXXL (available for white & blue only), add $5.80 each. Custom Artwork: Please submit black and white, camera-ready artwork. If you need artwork preparation, or to e-mail it to us, go to the following link: Requirements to prepare your artwork, or to e-mail it to us, click here. Shipping charges: Add $9.95 for first shirt, plus $2.00 for each additional one. Place your order Now!, click here.